Quakers arrived from Virginia, North Carolina, and New Jersey. Jeremiah Parker named their meeting "Richsquare" after his previous meeting in North Carolina. The first log meetinghouse was built and also used as a school. Caleb Wickersham, Thomas Newby, and other congregation members were active participants in the Underground Railroad. Separate frames were built for both the meetinghouse and the schoolhouse. These frames were destroyed by fire. A new school was built and used for worship as well. A meetinghouse frame was built for the second time. Many of the Friends died during a typhoid epidemic that swept through the neighborhood. Some of the congregation's families moved to Iowa, Kansas, and further west. The Quaker leaders were opposed to war, but twenty young men from the neighborhood served in the Union. Six were killed; five wounded. A brick meetinghouse was built. This is the same building Richsquare Meetinghouse occupies today. One of the first country women's literary clubs was organized at Richsquare and named "Sesame Circle." After 100 years of meeting, Sesame Circle was laid down. The congregation sold a piece of their land in order to buy furniture for the meetinghouse. This furniture included custom-designed pews. These pews still reside in Richsquare Meetinghouse. 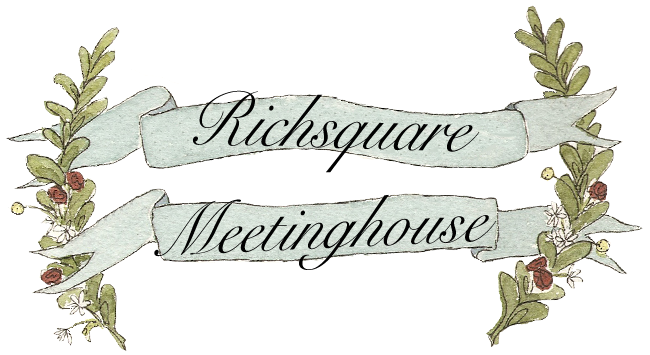 Richsquare changed from preparative to a full-fledge meeting. Mildred White, member of Richsquare, taught in the Friends Schools in Ramallah, Palestine. The Richsquare Centennial was held. Etta S. White wrote Welcome, and it was recited by Janet Johnson on June 30th of that year. The members built the Fellowship Room as an addition to the main building. Truman Kenworthy, Murvel Garner, Merton Scott, Larry Page, Clyde Thralls, and others were part-time pastors of Richsquare. Teachers and Students from Earlham School of Religion, as well as students from Earlham College, came from the 60s through the 80s. D. Elton Trueblood and Mildred White spoke at Homecoming ceremonies. Lightning hit the steeple of Richsquare, but the building was saved and the damage restored by October of that year. Mary Elizabeth Long was pastor until 1984 when the last Homecoming was held. Tom Mullen was the Homecoming speaker. The members of Richsquare approved the laying down of the meeting. The closing meeting for worship at Richsquare Meetinghouse was held. Friends of Richsquare, Inc. was established to preserve and maintain this beloved meetinghouse.